This three-part webinar series addresses the three most important areas of HR—hiring, leaves of absence, and termination. Each 90-minute webinar will cover the seven key issues of each area that you need to know and will provide you with the opportunity to ask questions and engage in a discussion with the presenter and fellow webinar participants. This webinar series is taught by subject matter experts, including employment law attorneys and HR professionals with over 30 years of experience. Whether you are new to HR or find many of your job duties involve HR, this three-part webinar series is for you. Don’t gamble with your HR knowledge. Register today! We are offering special introductory pricing for this webinar series. Don’t miss out on this discount! *Cost is per webinar participant. Please register each individual who will be participating in the webinar series even if all individuals will be using the same computer or email address. This program is approved for 4.5 HR (General) recertification credit hours toward aPHR™, PHR®, PHRca®, SPHR®, GPHR®, PHRi™ and SPHRi™ recertification through HRCI. 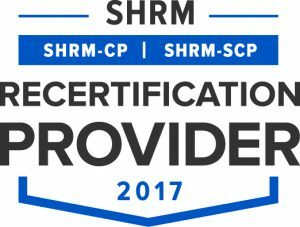 This program is valid for 4.5 PDCs for the SHRM-CPSM or SHRM-SCPSM.